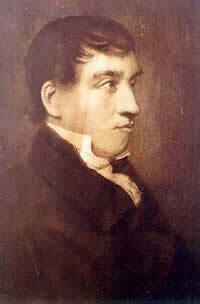 Dr William Gill, the posthumous benefactor and founder of Gill College, Somerset East, was born in 1792. His family lived in the village of Market Harborough in Leicestershire, England. His father was a clergyman, and William grew up in this lovely area, getting to know and appreciate the plants and the natural wonders of the countryside. He was a studious and popular boy at school, and was always an achiever, determined to excel at whatever he did. At the age of 18, in 1810, as was the custom in those days, he was indentured to serve a five year apprenticeship in medicine with a Doctor Thomas Peck, in Wellingborough, Northampton. At the end of this time, having impressed Dr Peck with his industriouness and willingness to learn, he went to Glasgow, to continue with his medical studies at the University. This was a happy time for him, and fond memories of the city and the university stayed with him all his life - so much so that at the end of his life, he asked that Gill College, named for him and endowed by him, should be modelled on his old university. It is for this reason the coat-of-arms of present day Gill College shows elements of the heraldry of Glasgow and the university, as well as the Gill and Cape coats-of-arms. On completing his studies, he did not take up his profession immediately, but took a "gap year" and toured Europe. He travelled through France, Italy, Switzerland and Germany, pursuing his interest in Botany. This journey may have given him a taste for travel, for a few years later, on 7th September 1882, the following notice appeared in the Cape Town Gazette - "Mr Gill, Surgeon, Apothocary etc. acquaints the inhabitants of Zwartland and its environs, the Koeberg etc. of his having established himself in the neighbourhood of the Zwartland church." 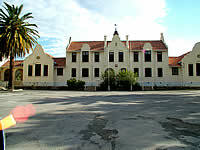 He had arrived in Cape Town some time earlier, and had served as District Surgeon at Caledon before moving to Zwartland. His practice thrived in what is now Malmsbury, and his work funded the achievement of the dream which had brought him to Africa, a hunting trip into the interior, and the chance to further his botanical collection. He purchased a wagon, necessary supples, and firearms, and hired two locals to accompany him. He trekked towards the North, and crossed the Orange River, but tragedy struck. A container of gunpowder accidently blew up, destroying most of his possessions, and he returned to the Cape disheartened, and began to make plans to return to England. Fortunately, for William Gill and for Somerset East, he was persuaded by two friends, the Reverend Thom and the famous Dr James Barry (who was later said to have been found to be a woman) to apply for the position of District Surgeon in a newly established town in the Eastern Cape - Somerset, later to be named Somerset East. Supported by these friends, he applied for and was given the post, and arrived in the town to replace a Doctor Jonge. The records speak of Jonge as a man "whose want of self control had secured his dismissal." Willian Gill arrived in Somerset to find a raw and sprawling village with about seventy houses. He settled in a house in Paulet Street in a building which was in later years known as Gill House. The wealth of botanical specimens to be found on the Boschberg satisfied his scientific curiosity, and he settled into a secure way of life, and made many friends in the district. In 1832, he and two friends (George Morgan and Magistrate Phillip Marillier) started up the Somerset Reading Society - which later lead to the formation of the Somerset East Public Library. By 1838, he was so firmly entrenched in local society, he was on the committee formed to help with the running of the local public school. His medical practice, his wide circle of friends, and his scientific interest in Botany kept him very busy, and this was obviously enough to fill his life, as he never married. Leah McMaster Kandaas was his housekeeper and cook for many years, and he had a manservant called Job, who also took care of him. He lived sparingly, never spending on himself, but was known to be wonderfully generous towards those in need, especially if they were patients of his. He did not make a great deal of money from his practice, and the riches he accumulated were from his farming activities. He began in a small way with a flock of merino sheep, and eventually owned a farm near Cookhouse which brought in the income which lead to whatever wealth he accumulated. Ill health dogged the last years of his life, he suffered from oedema, and was confined to spending his life on a couch, able to gaze at the slopes of his beloved Boschberg, where, when young and healthy, he had roamed and collected orchids and many other specimens. In his last days, he asked that he be able to gaze upon his beloved mountain, and when he died in 1863, aged 71, he was buried upon the slopes of the Boschberg. he had spent almost 40 of those 71 years in Somerset East. In his will, he left £23 000 to be used to set up and run an institute of higher learning. It was stipulated in his will that the money not be used for buying or erecting buildings; and the farmers and people of the district undertook to fund the building. Seven local men, including Robert Hart, were made trustees, and given the task of following his wishes. 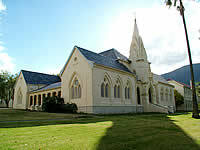 A committee of locals was formed in 1865 to build the school, and the foundation stone was laid in 1867. Gill was opened in 1869, six years after his death. In 1916, his remains were buried in front of the school which he endowed, and which was named for him, Gill College. The magnificent campus is a fitting memorial for such a man.